In contrast to the graveyards that immigrants to North America initially created, the picturesque gardens early and mid-nineteenth century Americans fashioned provided a remarkable set of sites where citizens of means could bury their friends and find respite from the rush of daily life in a parklike setting. Yet, these rural cemeteries also quickly proved to be extremely expensive places for the dead and the living. 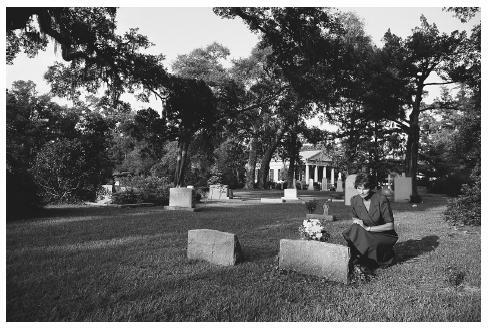 As a consequence, not long after the opening of America's first rural cemetery in 1831, we find the materialization of a rather different kind of gravescape that sought to address the rising expenses of death and reflects an altogether different sensibility. Tracing the development of this new cemeterial environment thus reveals not only the outlines of a new cemeterial form, but also the appearance of a new way of looking at life and death. Although signs of a new cemeterial sensibility began to appear in the United States as early as the middle of the nineteenth century, the development of a gravescape that fully reflected that sensibility came largely through the efforts of Adolph Strauch, the superintendent of Cincinnati's Spring Grove Cemetery. Just ten years earlier Spring Grove had been created as part of the wave of rural cemeteries that swept across America, but Americans of modest means quickly fostered the need for a less ornate, more frugal place for their loved ones. Originally, the plan to redesign Spring Grove appears to have been directed primarily at removing the ironwork and coping that even rural cemetery owners often described in derogatory terms. But in 1855 Strauch took the plan several steps beyond reformers' expectations. After removing the copings and ironwork that defined individual plots, Strauch also eliminated burial mounds, hedges, stone fences, numerous trees, tombs, and gravestones, which growing numbers of citizens thought unnecessarily "break up the surface of the ground, cut it into unsymmetrical sections, destroy the effect of slopes and levels, and chop up what should be the broad and noble features of one great picture into a confused and crowded multitude of what seem like petty yards or pens" (Morris 1997, pp. 145–146). By redesigning through negation Strauch had reconceptualized places of the dead, which transformed the cemetery into a landscape "more spacious and parklike. It ceased to be a motley collection of every style, each enclosed in its own well-defined space, and became instead an integrated composition of lawn and clusters of trees" (Jackson 1972, pp. 70–71). As one contemporary proponent of lawn cemeteries has remarked, Adolph Strauch "created what is known as the lawn cemetery; one in which the size and design and placement of the memorials are subject to esthetic control, and where all extraneous ornaments—railings, plantings, cemetery furniture—are forbidden in order to preserve an open and harmonious environment." of erecting a memorial, and disallowed flower-beds and a host of other individualized efforts that had become hallmarks of rural cemeteries. Strauch's reconceptualization through redesign was a radical departure from the values of and sentiments expressed by cemeterial designs znot only in the United States, but more globally, as advantages. First, it provided visitors with an open vista, unobstructed by fences, memorials, and trees, where signs of death and the dead find no quarter and where, at least ostensibly, an individual's societal station or place finds little expression. Second, it allowed cemetery superintendents to make the most efficient use of the land in the cemetery, thereby advancing the view that "individual rights must be subordinated to this general plan." "Civilization," according to Matthew Brazil, one of the lawn cemetery's early proponents, "consists in subordinating the will of the individual to the comfort and well-being of all" (Farrell 1980, p. 118). Third, by eliminating fences, hedges, trees, and other things associated with the rural cemetery, and by requiring markers to be small enough to be level or nearly level with the ground, proponents were able to eliminate nearly all things they associated with church graveyards and rural cemeteries. Together, as Sidney Hare, another early champion of this gravescape, remarked, these "improvements" allowed citizens to eliminate, albeit gradually, "all things that suggest death, sorrow, or pain" (Farrell 1980, p. 120). Perhaps the strongest advantage to which proponents of this design could point, however, was that their new cemeterial form considerably lowered the cost of burial. When Mount Auburn, America's first rural cemetery, opened for public burials, for example a single lot of 300 square feet cost $60. By the time Adolph Strauch finished redesigning Spring Grove Cemetery in 1855, the price of a lot at Mount Auburn had increased to $150, and by 1883 lot prices ranged from $225 for an "unexceptional lot" to $750 for "choice lots" (Morris 1997, pp. 147–148). Add to this the cost of an elaborate memorial, creating a burial mound, landscaping the lot, an iron or stone enclosure, as well as the cost of the funeral, and the total was well beyond the modest means of most citizens. By contrast, as late as 1875 the lot prices at Spring Grove ranged only from thirty to fifty cents per square foot—in equivalent terms, from $90 to $150 for a lot of 300 square feet. And, having eliminated elaborate memorials, grave mounds, enclosures of any kind, and the various other things that make burial in the rural cemetery extraordinarily expensive, survivors encountered few costs to add to the price of the funeral itself. As one vocal lawn cemetery advocate, F. B. Perkins, proudly told his readers in 1871, "it is a curious illustration of the power of habit over right reason, to see wealthy proprietors sinking a heavy granite coping around a lot, expending perhaps $2,500 or $3,000 for the sake of making the place look like a magnified city 'area,' and when placing a monument within it at a cost of say $2,000 more." A growing number of Americans were moving rapidly to the conclusion that the "mere statement of the contrast shows how incomparably superior in solemnity and impressiveness is the landscape lawn plan" (Morris 1997, p. 148). Lawn cemeteries did not take the public mind by storm, as did the rural cemetery, but they did increase in number nearly as swiftly as rural cemeteries had; and in the years following the U.S. Civil War they became the most commonly created gravescape—a clear measure of the influence advocates of this gravescape were beginning to have at the national level. Instead of presenting viewers with markers to remind them of their need to prepare for death or with elaborate memorials nestled in sylvan scenes, as earlier gravescapes had sought to do, the modern lawn cemetery presents viewers with "a landscape more spacious and park-like" (Jackson 1972, p. 70) and with memorials that suggest very little in the way of artistic skill, particularity, or death. Typically, when memorials consonant with this gravescape appear in other gravescapes, the lack of cemeterial restrictions result in memorials that are overtly expressive of sentiments compatible with the lawn cemetery's values. True to the mandates of the Strauch's design, however, cemeterial rules and regulations in lawn cemeteries require markers to be small and, in the vast majority of instances, flush with the ground. The size and position of the markers thus ensure not only that lot owners will be able to erect memorials in an environment that is clearly indicative of their values, but also that anyone who wishes to bury their friends and loved ones in this gravescape will have exceedingly little opportunity to alter or contradict the scene with incompatible sentiments. In developing this gravescape cemetery, superintendents and owners successfully eliminated not only those things that rural cemetery owners acknowledged were excesses, but also those things lawn cemetery patrons regarded as excessive— especially efforts to particularize the gravescape, individual lots, or markers. Rather than allowing lot owners latitude to "beautify" the cemetery, cemetery owners and superintendents assumed all responsibility for cemeterial aesthetics. As a consequence, those few "works of art" that do appear in lawn cemeteries are selected and situated by others so that the will of the few may be subordinated to the comfort and well being of the many. Bergman, Edward F. Woodlawn Remembers: Cemetery of American History. Utica, NY: North Country Books, 1988. Bigelow, Jacob. A History of the Cemetery of Mount Auburn. Boston: Munroe & Brothers, 1859. Farmar, Alfred. "The Modern Cemetery: The Perpetual Care Lawn Plan." Overland Monthly 29 (1897):440–447. Farrell, James J. Inventing the American Way of Death. Philadelphia: Temple University Press, 1980. Jackson, John Brinckerhoff. American Space: The Centennial Years, 1865–1876. New York: W. W. Norton, 1972. Morris, Richard. Sinners, Lovers, and Heroes: An Essay on Memorializing in Three American Cultures. Albany: SUNY Press, 1997. Oring, Elliott. "Forest Lawn and the Iconography of American Death." Southwest Folklore 6 (1982):62–72. Weed, Edward Evarts. Modern Park Cemeteries. Chicago: R. J. Haight, 1912.